The Limited Edition Ruby Scarab deck shows well-stylized designs of royalty living and ruling their earthly kingdoms. Their human life is signified by ruby accents-representing the blood of life-against monochromatic color schemes with hints of gold signifying royal status. All Ruby Scarab cards are set against a white background, representing the sacredness of life on earth. From building colossal pyramids to sculpting masterpiece sphinxes, ancient Egyptians were masters at executing the inconceivable, thanks to their extreme attention to detail. To honor their meticulous methods, the artwork of each Scarab deck pays homage to ancient Egypt's style and class. 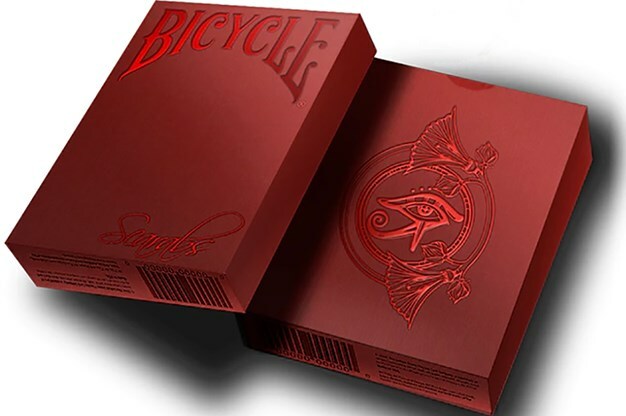 The artwork of the Ruby Scarab deck reigns true to the artwork of ancient Egyptian times. Created with well-defined lines and distinct contrast, this deck resembles artwork that could only be created by earthly hands. Bring ancient Egypt's royals to your next card game... after all, who's better off in your hand than the most majestic rulers in history? Bring the forces from beyond with the help of the Limited Edition Scarab decks to ensure that your game will be victorious.